For over 150 years, Californians have argued, litigated, yelled, and otherwise fought over water. California is a big state – we have redwood forests, desert regions, mountains, coasts, rich agricultural lands, amazing natural ecosystems. And overall, we have a pretty good amount of water. The problems with California’s water are that it is highly seasonal, highly variable, and poorly managed. Now, halfway through the second decade of the 21st century, we’ve hit the wall. California is in a drought – some call it the third year of a drought, but it could also be called the tenth dry year out of the last thirteen (see Figure 1). Even if next year brings some relief, our water problems will remain. Figure 1. 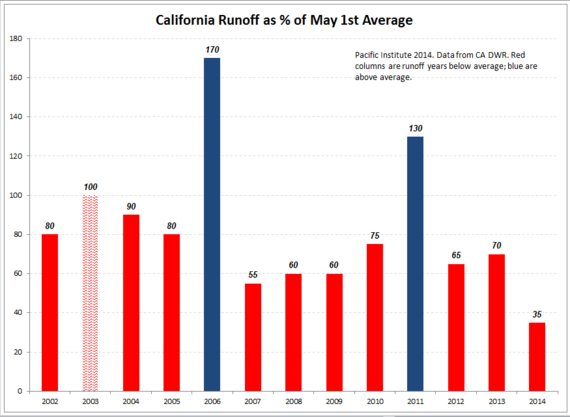 California runoff as a percent of May 1st average, since 2002. The problem is that even in wet years, California has passed the point of “peak water.” We have maxed out the renewable water available in our rivers – allocating to users more than nature provides even in a wet year. We are unsustainably overdrafting our groundwater – turning a renewable resource into a non-renewable resource – and we are plunging toward an economic, social, and political catastrophe in the groundwater basins of the Central Valley. We are past the point of “peak ecological water” – the point where our use of water now causes far more ecological harm than it provides benefit. Overall, on average, we use at least six million acre-feet a year more than we should. Everyone who works on California water issues knows these things. Everyone who works on California water knows that “business as usual” cannot continue. The arguments have always been on how to change our policies to bring our use into line with nature’s limits. Today, four studies have been released by the Pacific Institute, Natural Resources Defense Council, and researchers from the University of California, Santa Barbara. These studies analyze four solutions to California’s water problems that are proven to work, widely available, and cost effective. Taken together, they have the potential to expand existing supply or cut current demand by a total of between 11 and 14 million acre-feet a year – a vast amount of water (see Figure 2). Implementing these strategies will take time and effort and money – they require incremental actions on the part of all Californians, from homeowners and residents to industry to water utilities to state and federal agencies. Figure 2. 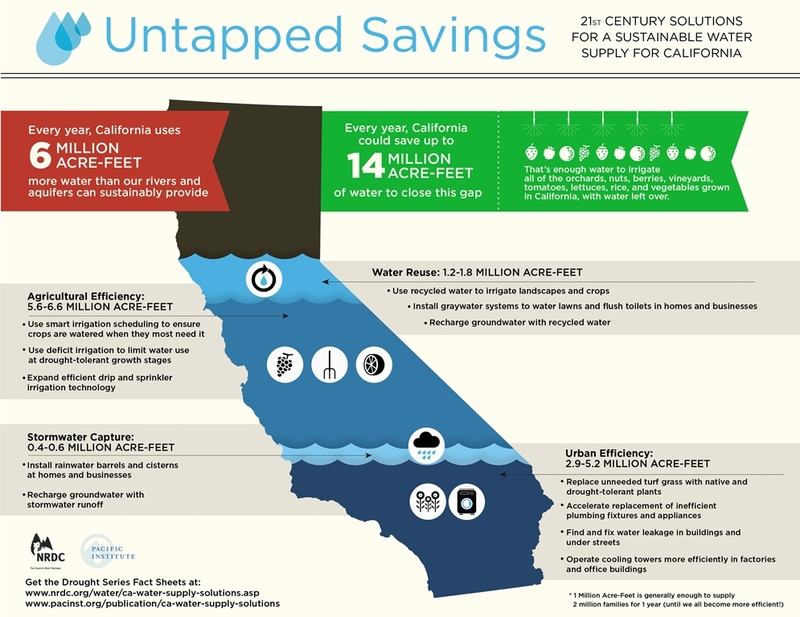 Summary infographic of four key solutions for California water. All together, these four options can provide new supplies and demand reductions of 11 to 14 million acre-feet per year, more water than used by California cities in their entirety today. These new studies don’t rule out other possible solutions as well. We didn’t look at controversial ideas like changing crop patterns, fallowing marginal lands, seeking large-scale water diversions from distant rivers, or building new dams or desalination plants. But the great potential, and limited opposition, to the four solutions in our new studies argue for quick efforts to move forward on them. The next step is a discussion about what policies and approaches can accelerate implementation of these four strategies: the best ones will be flexible combinations of markets, education, and regulatory and financial incentives and disincentives, but policy makers and the public must agree on them. Whatever we do, the current drought is clear evidence that doing nothing is no longer an acceptable option. It baffles me that in a state with huge water needs for agriculture combined with spotty water resources, city, county and state representatives allow situations such as I see in Palm Desert where there are a dozen golf courses with water features and lots of green grass. There is something wrong with providing the wealthy, privileged few with copious amounts of a scarce resource that belongs to ALL of California citizens. Please tell me that these enclaves for the rich is watered with recycled waste water.